Babblings of a Mommy: This Would Scare The Bejeezus Out Of Me. This Would Scare The Bejeezus Out Of Me. I know that the designer would like us to focus on how chic & swanky this crib is--but all I can think about is how freaked out I would be if this were my kid! Oh. My. Word. I would not feel safe leaving my child dangling from the ceiling like this, would you?! Those strings just seem so flimsy and would give way at any second! Not to mention I don't know how you would secure it to the ceiling. I don't know--this is just bizarre to me. I couldn't find much information on this crib except that it's called the Knoppa Hanging Crib and that's it from a Swedish designer. But what do you think? Baby Chic or an Accident-Waiting-To-Happen? I agree with you. I also feel that it does not look so chic, in fact, it looks rather claustrophobic. Call me old school, but I still like the traditional bassinets with a good solid base. 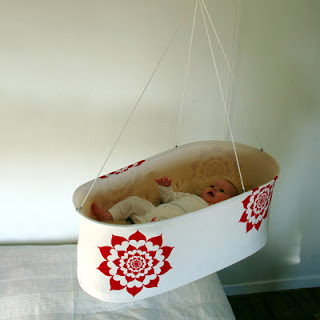 Call us BOTH old fashion because I prefer a traditional bassinet as well.